Collage - reconnecting with play. Literally coming from the French word coller, "to glue”, collage is the assemblage of different forms to create a new whole. This workshop will be divided into two distinctly different sessions. In the morning, students will create their our own collage materials by using a combination of paper, fabric-based materials, drawing and painting. The components made will result from a playful reaction to the materials, and emphasis will be given to creating as many pieces as possible in a short space of time. This speedy process will free students creatively. No time for fear or self-doubt! 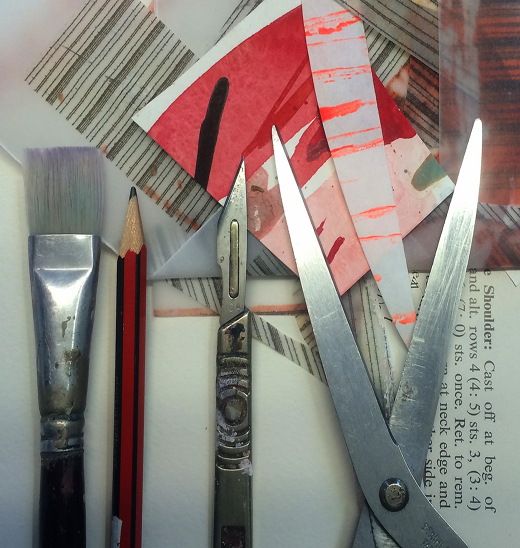 We will experiment with various approaches to collage, using these components as our foundation. The messier the table, the better! Black, water-based drawing ink. No need to buy an expensive brand and a small bottle will do. 1 x round, pointed synthetic brush, size 2. 1 x flat, cheap, wedge-shaped brush. Synthetic bristles are best, but a hog hair-brush is also fine and a cheaper alternative. Size -1” or 2” wide. 1 x sheet Bristol board- 500 x 650mm, 250GSM. Can be bought at Eckersleys and Port Art Supplies. Bainbridge board is a good alternative, but costs more. Premier Art Supplies stock Bainbridge board. (See below for Stockist details). Assorted acrylic, watercolour or gouache paints, that you might already have at home. This will be used as a glue for the heavier materials such as card and fabric. Eckersleys stock Matisse Derivan Gel Medium. This is what Sue uses, but a cheaper brand should do the job. If you are unsure, ask the shop assistant, telling them what you will be using it for. A bag of collected materials. fabric scraps, ribbon, paper bags etc. Anything will do providing it isn't too heavy or thick to stick down. Sue Ninham has been teaching at UniSA for over 12 years and currently runs workshops at the State Gallery of SA for Year 12 students. Ninham has also taught at Sydney College of the Arts and Randwick TAFE. She has been a finalist in numerous National art awards and was the winner of the 2012 Fringe Poster award. Her work has been exhibited extensively in Australia and overseas. Drawing on experience gained as an illustrator and visual artist over a 30 year career, her studio workshops focus on teaching skills and techniques, using a variety of mediums. The one-day workshops cater for practicing visual artists who want to learn something new, tertiary art and design students and those who have little or no art experience but a load of willingness and curiosity. Small class sizes ensure a positive hands-on approach and specialized attention for each student. The sessions are relaxed and informal, with an emphasis on creative discovery. Sue aims to send each student home with their finished work of art and a set of skills they can build on. Kent Town, SA 5067. Ph: 08 8362 7674http://www.premierart.com. Brick and Mortar Creative Retail Hub has a cafe downstairs from the workshop area serving coffee, tea and something to eat. The building is located in the heart of Norwood's shopping precinct if students need to duck out at lunchtime. To enrol in this workshop, please fill in the form below and submit. An email reply will be sent to you with a link to PayPal. To secure your place, full payment must be received via PayPal prior to session date. Please note - There will be a limit of 8 students per workshop. All images copyright © 2015 Sue Ninham. All rights reserved.